Recently I was asked if it's possible to record from Skype using Apple's GarageBand software that comes with OS X, even though I knew it was possible I couldn't find any tutorials on how, so here's what I did. Because GarageBand only takes input from devices and soundcards, not applications, we're going to download and install SoundFlower for OS X. 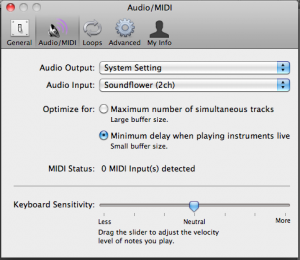 Once SoundFlower is installed, it creates a virtual sound card that can be used by any application on your system, lets select it to be our input source in Garage Band. 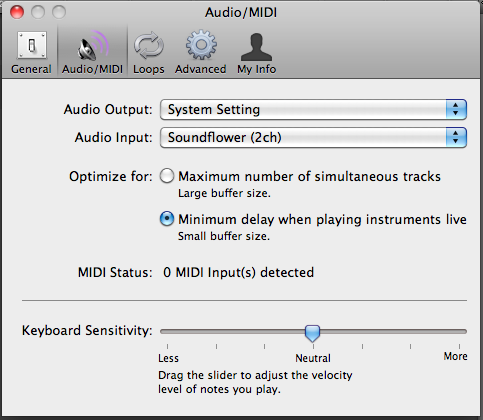 In your project go to Garage Band -> Preferences, choose the "Audio/MIDI" tab and select "Soundflower (2ch)" as our Audio Input. Looking at the Instrument panel, we see that our Input Source has changed, lets go ahead and set up the Monitor to On or On (no feedback protection). This will let us hear the output from Skype through our default output (speakers, headphones, etc) while we record it with Garage Band. IMPORTANT: If Monitor is not enabled in GarageBand you will not hear anything on the Skype call. Now that GarageBand is configured, lets set up Skype. Open up the Skype menu and go to Preferences. On the Audio tab, we want our call output to go to SoundFlower, so change "Audio output" to "Soundflower (2ch)". Now go into GarageBand, click on record, and make a call. Insert Happy Dance here.